The fallen smartphone giant's transformation is almost done. BlackBerry's (NYSE:BB) transformation into a software and services specialist is almost complete, as the company's second-quarter results for fiscal 2019 indicate. Its legacy businesses are almost done with, while the two key areas that will be critical to its long-term growth are chugging along nicely and should flourish in the long run. As such, it shouldn't be long before BlackBerry starts firing on all cylinders and starts giving investors the gains that they have been waiting for. Let's take a look at the three key factors that could catalyze BlackBerry stock. BlackBerry's top line has been in a state of decay for the past few years as the company focused on pivoting its business from selling smartphones to selling software and services. However, it shouldn't be long before Blackberry's revenue returns to growth, as its legacy businesses have become almost non-existent. BlackBerry's device and service access businesses generated just $17 million in revenue during the second quarter, down from a $53 million contribution in the prior-year period. This was the biggest reason behind the 14% year over year decline in BlackBerry's total revenue, which fell to $214 million during the quarter. The good thing is that these two legacy business lines now supply less than 8% of BlackBerry's total revenue, down from 21% in the year-ago period. As it stands, the licensing, technology, and enterprise software businesses now enjoy greater clout at BlackBerry. The company's licensing revenue increased nearly 29% annually to $49 million, and now accounts for 23% of total revenue. The enterprise software business is now BlackBerry's biggest money maker, producing 43% of its top line, and it would have experienced low single-digit growth but been for the ASC 606 accounting change implemented in the first quarter. BlackBerry is now recognizing revenue from perpetual licenses over a four-year period, a shift from its earlier practice of recognizing the inflow immediately. As perpetual licenses make up 20%-30% of the company's revenue, the accounting change has led to a drop in the enterprise revenue on a year-over-year basis in the current fiscal year. However, this business spiked 11% sequentially last quarter, indicating that the enterprise segment continues to enjoy strong momentum. In all, the businesses that are supposed to do the heavy lifting for BlackBerry are in good shape, and this will help the company return to top-line growth sooner rather than later. BlackBerry's pivot toward selling software and services has opened up attractive avenues for the company, such as enterprise security. The company is targeting the enterprise space with the BlackBerry Secure and the recently launched BlackBerry Spark platforms. BlackBerry Secure is an end-to-end enterprise software solution that was originally launched to help users in organizations communicate securely and exchange files using their mobile devices. With time, BlackBerry has added a slew of features to this platform, and has struck partnerships with the likes of Microsoft to provide enterprise security on mobile devices across popular platforms such as Office 365. The recently launched BlackBerry Spark, on the other hand, is an Enterprise of Things platform that allows organizations to create custom user experiences in a secure way with the help of artificial intelligence. For instance, the BlackBerry Spark platform can help hospitals alert a medical team if a patient's heartbeat slows down. What's more, it can assist in the treatment process by sending elevators to the location of the medical team, or by delivering prescribed treatments when the alert is triggered. As such, BlackBerry is smartly targeting the enterprise space by getting into key areas such as security and the Internet of Things. This should help secure its long-term growth given the growth potential of these two verticals. But the most important thing to note is that such opportunities will help BlackBerry grow its business profitably. BlackBerry experienced a double-digit drop in its revenue last quarter, but that didn't prevent the company from boosting its bottom line. In fact, the software specialist's net income jumped 126% year over year to $43 million thanks to a superior margin profile. BlackBerry's gross margin increased 3.2 percentage points in the second quarter compared to the prior-year period. This isn't surprising -- software-centric businesses generally carry higher margins because of their recurring nature. As it turns out, 81% of BlackBerry's software and services revenue was recurring last quarter, up 2 percentage points from the prior-year period. There are several advantages of having a higher proportion of revenue be recurring. For one, BlackBerry can reasonably predict its revenue. For another, it can sell new services to its existing customers without having to spend a lot of money on marketing. This lowers the company's customer acquisition costs and boosts the margin profile. 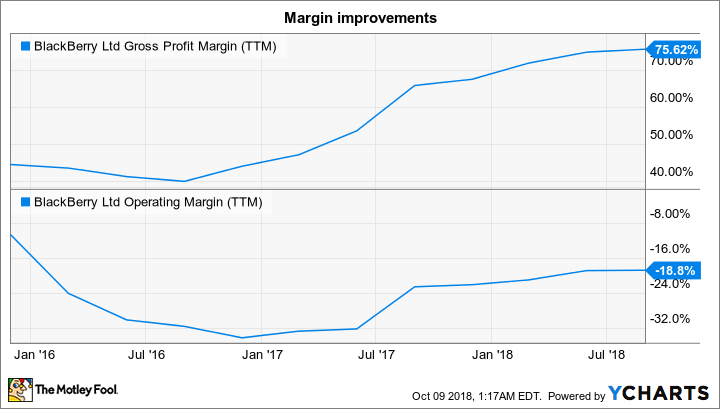 Not surprisingly, the company's margins have shot up impressively since 2016, the year when it decided to exit the hardware business. BlackBerry investors can expect higher margins going forward once solutions such as BlackBerry Spark hit the market, giving it more opportunity to cross-sell to existing customers and boost earnings. The bad times are finally over for BlackBerry. The company's software transformation is already benefiting its bottom line, and it won't be long before the top line starts moving in the right direction thanks to the opportunities it is sitting on. This is probably why its earnings are expected to grow at a CAGR (compound annual growth rate) of almost 24% over the next five years, giving investors a solid reason to buy into BlackBerry's transformation.